What Ford Fiesta models are available? | Karl Flammer Ford Inc.
What Ford Fiesta models are available? The 2018 ST design of the 2018 Fiesta sets itself apart from other popular subcompact cars. Our team here at Karl Flammer Ford Inc. are excited to present some of the features of this car. With a turbocharged EcoBoost engine, the Fiesta ST is built with performance in mind. 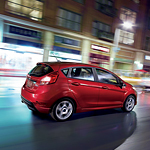 Coupled with it are features that help you maintain handling while pushing the Fiesta to its limits. Not only does it feel like a sports car, it looks like one as well. The twin chrome-tipped exhaust and fascia extensions are sure to impress passersby. The interior accents this racing appeal with aluminum pedals and partial leather seats. This is just one of the many options available when you select a 2018 Fiesta. We invite you to visit our team to see what other features are waiting when you take one out for a test drive in Tarpon Springs today.